Water comes down through a big hole in the rock instead of spilling over a cliff. Every day around 11am or so, sunlight shines through the hole at the same angle as the falling water which gives it a magical glow. However, the name Saeng Chan means "moonlight". Perhaps "sunlight waterfall" doesn't sound as romantic. Pha Taem National Park is about 20 kilometres from Khong Chiam, which is 80 kilometres east of Ubon Ratchathani. 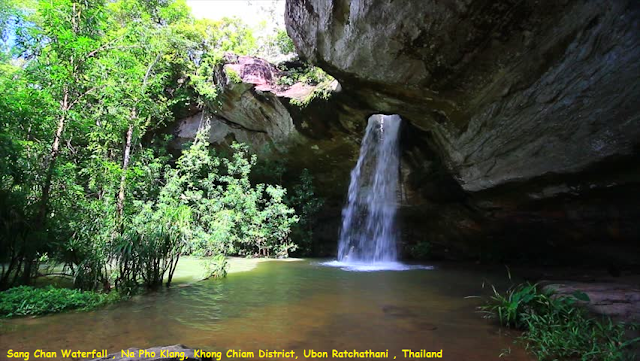 To get to Saeng Chan Waterfall, you have to go 19 kilometres further north from the park headquarters (via Highway 2112) to Ban Na Pho Klang where you'll find an access road to the site. You can have shower under the waterfall.